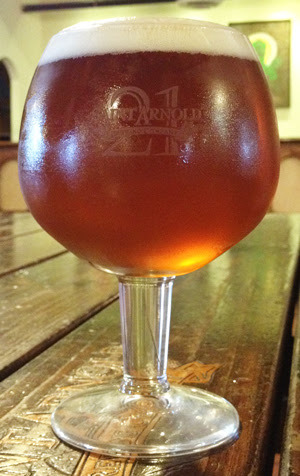 Saint Arnold Brewery Celebrates 21st Birthday! The original plan for Saint Arnold’s 21st birthday coincided with Houston’s Free Press Music Fest, so the brewery decided to change its original concept as to not compete with the festival, and essentially, themselves. [On June 6th, 2015] we will host our regularly scheduled Saturday tours. After that, we will open our Tour Hall from 5:00 – 10:00 PM for a special Pub Night. On Pub Nights, there is no admission – you simply choose what you want to purchase. We’ll have food trucks on hand, and you’re welcome to bring in your own food. Special beers available for the evening will include 20th Anniversary Ale three ways: the original celebratory Barleywine, a sneak preview of BB10 (Bourbon Barrel 20th Anniversary Ale) and a special keg of Cognac Barrel Aged 20th Anniversary Ale. Also, to celebrate her 21st birthday, we will tap a cask of Amber Ale with Mosaic hops. OMG YALL! AMBER IS 21! Our Special Souvenir 21st Anniversary Glass will be available on Saturday for $10, which includes a token for a beer from our regular lineup. Both sessions of Sunday’s Special Rare Cellar Tasting will continue as scheduled. See the full beer lineup for Sunday here.